Bertrand, Ernest S, Jr., CFD, (Retired), passed peacefully Sunday (1/3/2016) surrounded by his loving family at RI Hospital. Born in Providence, a son of the late Ernest S. Bertrand, Sr. and Elizabeth (Barnard) Bertrand. He had lived most of his life in Warwick and was married to Beverly A. (DiPippo) Bertrand. 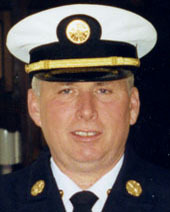 Chief Bertrand was with the Cranston Fire Department for over 27 years before retiring in 1994 with the rank of Deputy Chief, Superintendent Fire Alarm Division. He was a US Navy veteran of the Vietnam War serving in the submarine division. He was a past recipient of the Eagle Award in the Boy Scouts. He was a past deacon of the Faith Family Chapel in Warwick and an elder in the Community Chapel in Cranston. Besides his wife he leaves 2 sons; Eric Bertrand (Jennifer) of Cranston and Paul Bertrand of Warwick, a brother Russell Bertrand (Diane) of North Kingstown, a sister Leola Giarrusso and five grandchildren Devon, Victoria, Veronica, Samantha and Benjamin Bertrand. He was grandfather of the late Michael Bertrand and brother of the late Janice Christy and Kevin Bertrand. His life will be celebrated with calling hours Thursday 4-7pm with a private service at 7:00pm.